October 28, 2015 is the golden anniversary for the St. Louis Gateway Arch; what’s less known is the icon’s 30 year struggle to be built. 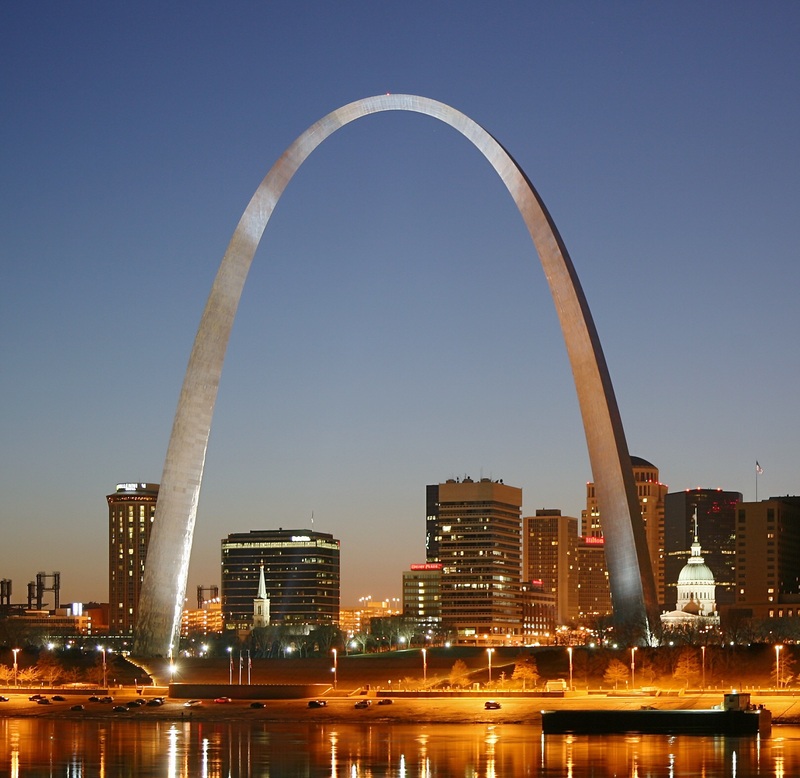 Today the iconic St. Louis Gateway Arch, Missouri celebrates it’s 50 year Golden Anniversary. The Arch was “topped off” fifty years ago on October 28th, 1965. The Gateway Arch, officially a portion of The Jefferson National Expansion Memorial, has long since become a familiar American, if not global, icon. Less known, however, is The Arch’s 30 year road to completion and its role in Missourian cultural identity. The Gateway Arch, like many other signature American architectural pieces, traces deep roots to the early 1930’s and The Great Depression. In the dire need to address unemployment during the Depression, President Franklin D. Roosevelt’s “New Deal” legislation appropriated considerable government spending to create new jobs through public works projects. The memorial that would become The Gateway Arch was first conceived as a public works project to achieve that aim. In 1933, attorney and St. Louis civic leader Luther Ely Smith, proposed a massive Mississippi riverfront monument to then St. Louis Mayor Bernard Dickmann. The monument Smith proposed would be dedicated to President Thomas Jefferson and Lewis and Clark’s historic western expedition which launched from St. Louis in May 1804. In late 1933, the monument project was sanctioned by the City of St. Louis in principle. The project was to be located in downtown St. Louis and aimed to create 5,000 new construction jobs. Additionally, the monument was designed to bring further tourism to the historic city, thus bolstering the city’s economy as a whole. Other than the monument’s desired location, honorees, and economic effect, little else was known about what final shape the project would take. Its right on the license plate! Though undecided in appearance, the paramount importance of the Gateway Monument’s history is how the final design was chosen. Missouri’s unofficial state slogan is “The Show Me State;” a statement meant to embody a greater cultural character based on the limitless capability of the individual, their high expectation for success, and belief based on tangible results. All of these facets form the identity considered vital for those who chose to build a new life on the American western frontier. Commensurate with Missouri’s enduring ethos, the monument design was generated through an open public submission contest. The selection process consisted of two elimination rounds and a jury panel of seven members. In essence, the monument’s final design would be the product of the very characteristics it wished to enshrine. The competition’s first round commenced in September 1947. The initial phase of the contest accumulated 172 design submissions. Of these, five proposals were selected as second round finalists. The unanimous winner was the proposal made by the architectural team headed by Eero Saarinen: a stainless steel arch, standing up to 630 feet tall. Eero Saarinen and Gateway Arch model. The simplicity of the arch shape, constructed primarily from glistening stainless steel, perfectly captured the imagination and symbolism the panel wished to express. A natural form that was understated by design, yet profound in communicating its depth of historical and cultural context. In the 30 years leading to The Arch’s completion, the monument faced obstacles common to major construction projects in urban areas. Issues such as proper federal and city financing, project budgeting, urban planning conflicts, labor relations, legal disputes, and continued community support all played major roles. Construction of The Arch itself did not break ground until February 1963. On October 28th, 1965, the construction of The Gateway Arch itself was finished, but the project in its entirety was not yet completed. To allow for the completion of the visitor tram to the Arch observatory located at its apex, as well as the visitor center located underneath The Arch, the monument would not fully open to the public until July 1967. Each capsule on the tram is roughly the size of a Star Wars escape pod. The Gateway Arch was dedicated on May 25th, 1968. In a figure adjusted for inflation as of 2013, The Gateway Arch cost $180 million and required roughly 35 years to come to fruition. The construction phase of The Arch required two and a half years to complete. The construction phase specifically holds a special distinction as it resulted in no worker fatalities. The St. Louis Gateway Arch was over 30 years in the making, and is officially 50 years old today. In the past 50 years, The Arch has become an unmistakable feature of the American architectural landscape. It is a symbol of St. Louis’ major role in American growth, and a enduring point of pride for Missourian’s as a whole. As of 2002, The Arch hosts an average of four million visitors each year.